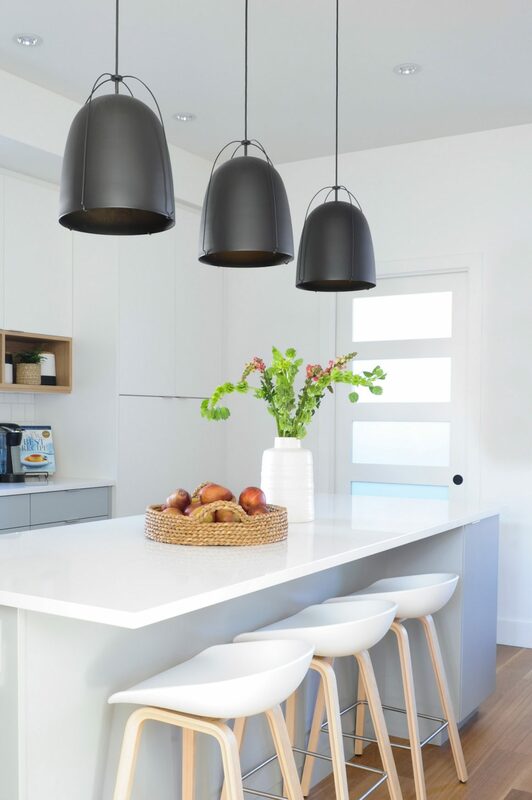 Three black metal dome pendant lights provide both lighting and visual contrast. Some homes have what are commonly referred to as good bones. These dwellings are sturdy, structurally appealing, and have not merely stood the test of time; they have almost improved with the years. But Greer Nelson and Jamie Hamilton look beyond the bones when they design a home’s interior, especially in a new home. They focus on what they call “the heart”: The kitchen. 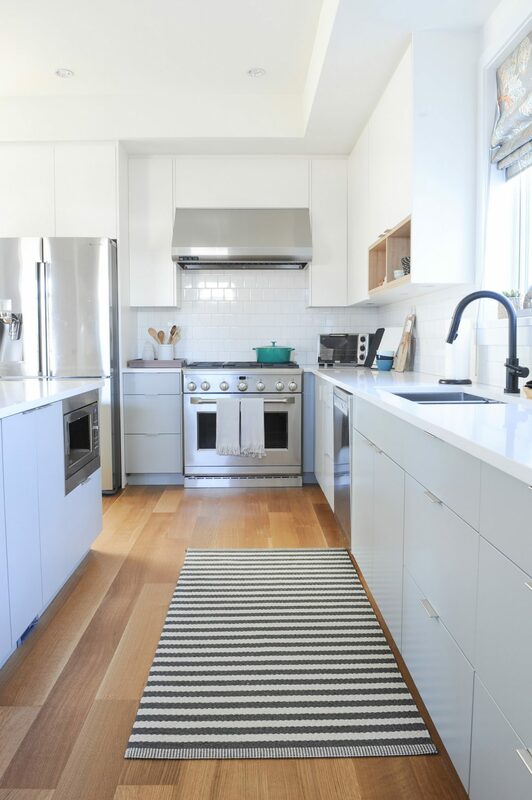 The stainless-steel appliances coordinate well with the warm-grey lower cabinets and natural oak floors. This space pumps the life and energy into a family’s day, they explain. It is the room that filters all the activity – from meals to homework, and casual conversations to entertaining. 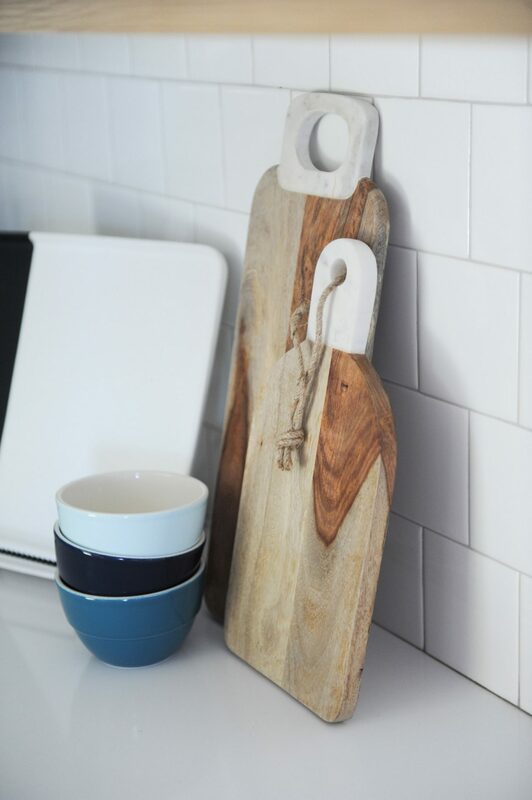 The kitchen is the home’s most vital organ. 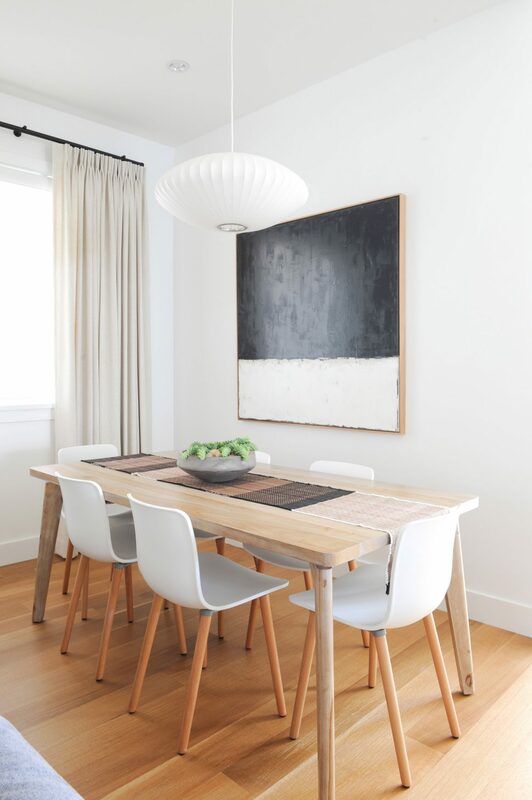 The dining room chairs, which complement the island’s stools and the table were purchased at CB2. These two designers are co-owners of Oliver Simon Design, an interior design studio that specializes in residential spaces. They put together the plan for this kitchen in a new three-level home, built in Vancouver. It started with the homeowners’ desire for a contemporary look. “We put together a complete design package,” Nelson says, which included two phases: the specifications that cover such basics as tile selections, flooring, surface materials and colours; and then the furnishings. 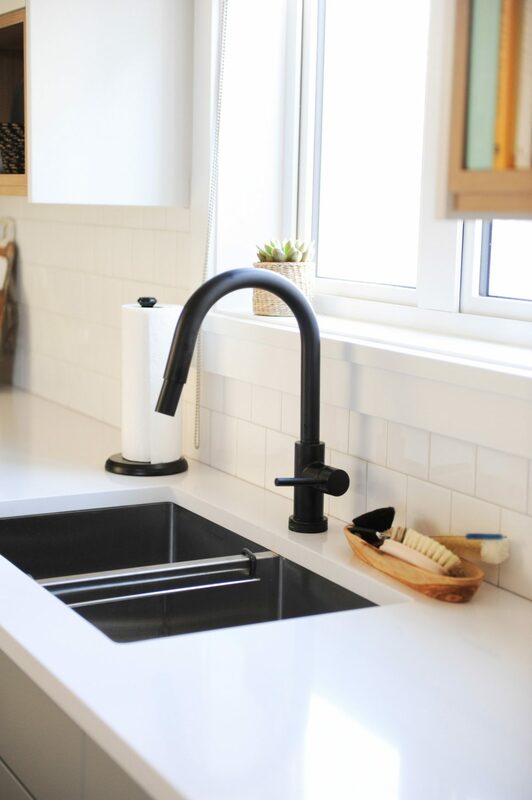 The matte black single-handle faucet by Brizo adds contrast in this almost-all-white kitchen. Part of the process includes extensive consultations with the owners, Hamilton says. This is when she and Nelson get to know the owners’ likes and dislikes. It is a procedure that involves spending time with the clients and pouring over images and styles so that the designers can also develop a sense of how the family lives. 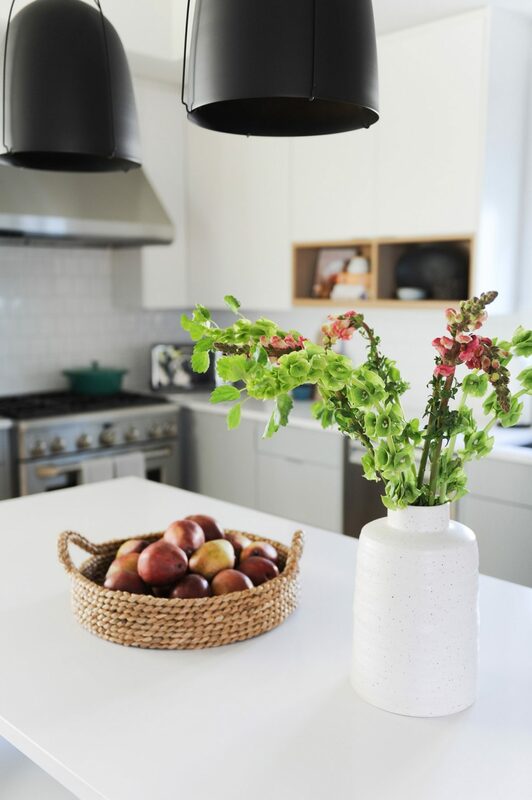 “For me, the important thing about a kitchen is to have organic elements – wood, flowers, plants, fruit,” says designer Jamie Hamilton. “We needed to make sure it would work for them,” says Hamilton. 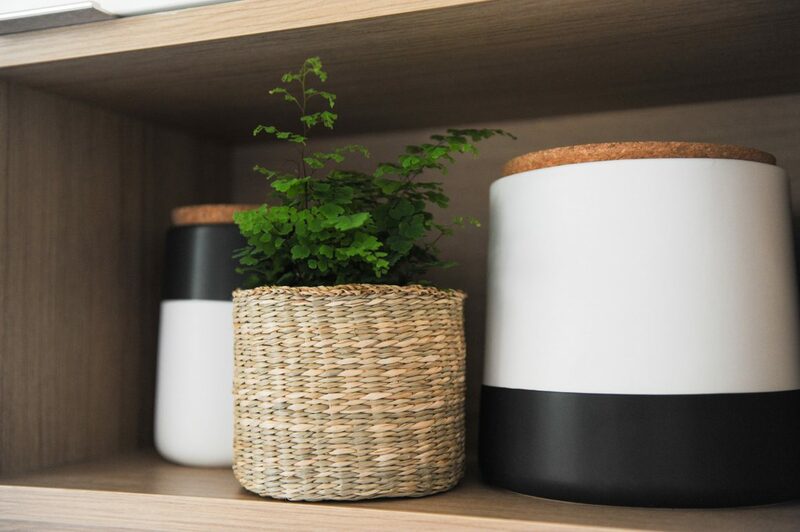 And in this case, the need for a lot of storage along with practical and easy-to-maintain surfaces were key for this busy family. “What we wanted to make sure of in a very modern home is to bring in some warmth,” Nelson says. To do that, they introduced elements to soften the bright white features that anchored the crisp, modern tone. 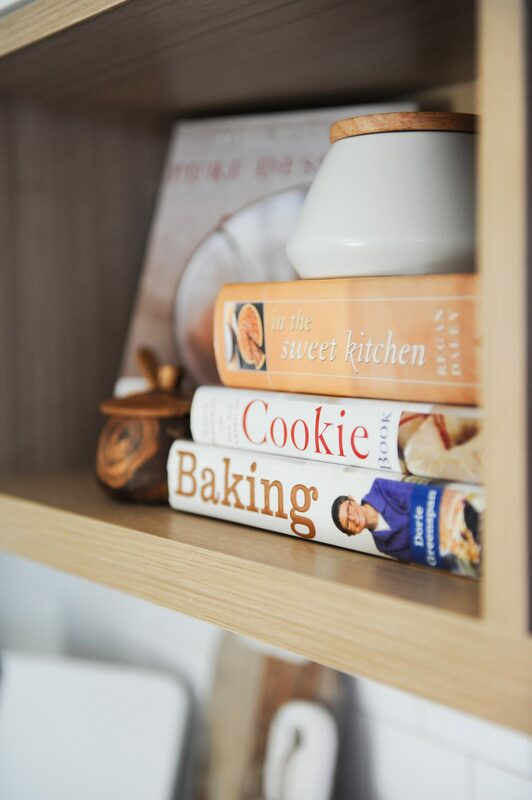 This meant incorporating highlights, such as the natural-wood cubbies in the upper cabinetry, designing the lighting, and adding small elements of colour. The cubbies offer an interesting visual as the wood closely matches the natural oak floors. 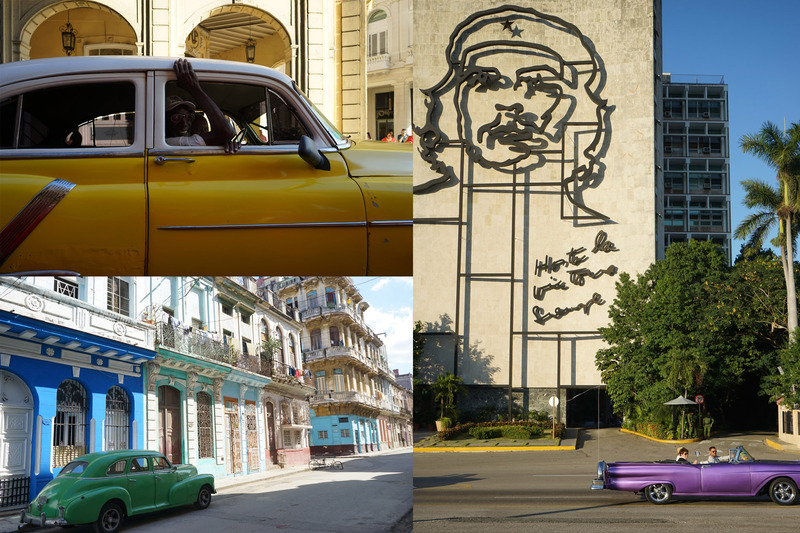 “It’s also a place you can display something meaningful and beautiful,” Nelson says. The Roman shade at the window in front of the sink is another softening element. The light pastels in the fabric add a dash of colour that can easily be updated and changed if desired. 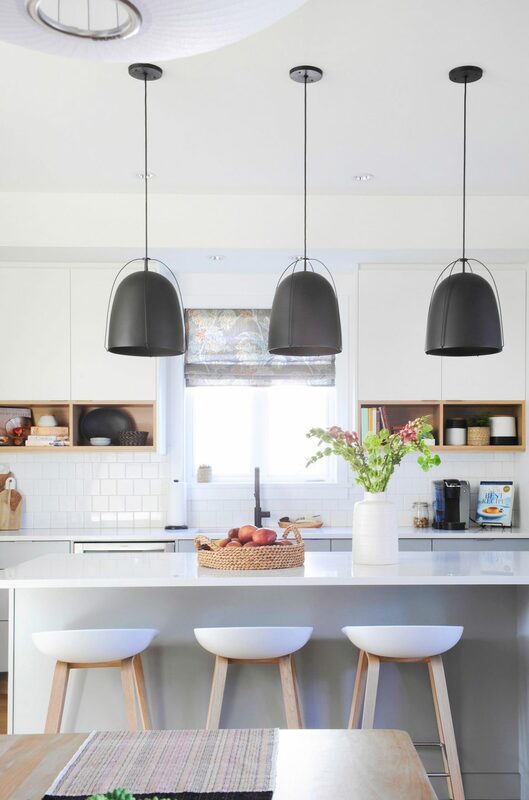 Hamilton also points to the use of a light grey on the lower cabinets as another way of keeping the contemporary vibe, while at the same time softening the stark whiteness of the room. “It makes it more interesting than pure white,” she says, while at the same time making the surface a bit more forgiving when confronted with children’s sticky hands. 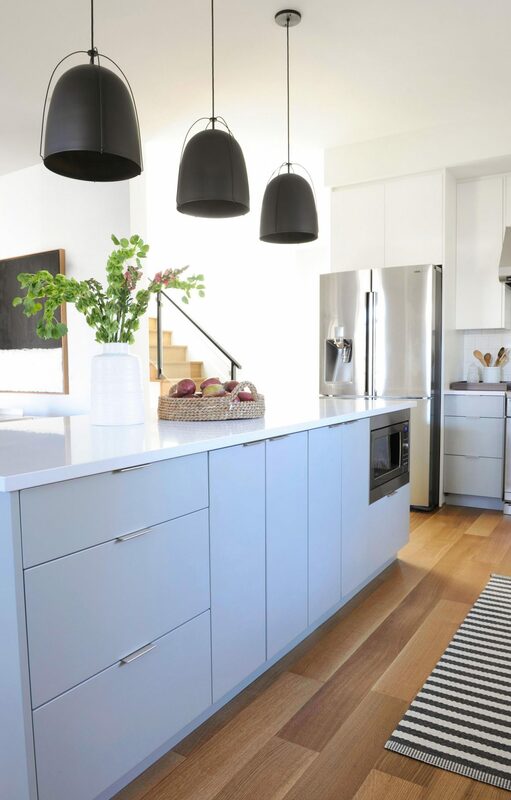 The contemporary look the owners wanted was made possible with the combination of white elements in this kitchen – the quartz countertops, the white upper cabinets and the four-by-four-inch porcelain wall tiles. The softer elements, including the light grey lower cabinets, the soft pastels of the Roman shade, and the natural wood cubbies offer a touch of warmth. The designers also suggested the matte black faucet for the same reason. “It’s dramatic. 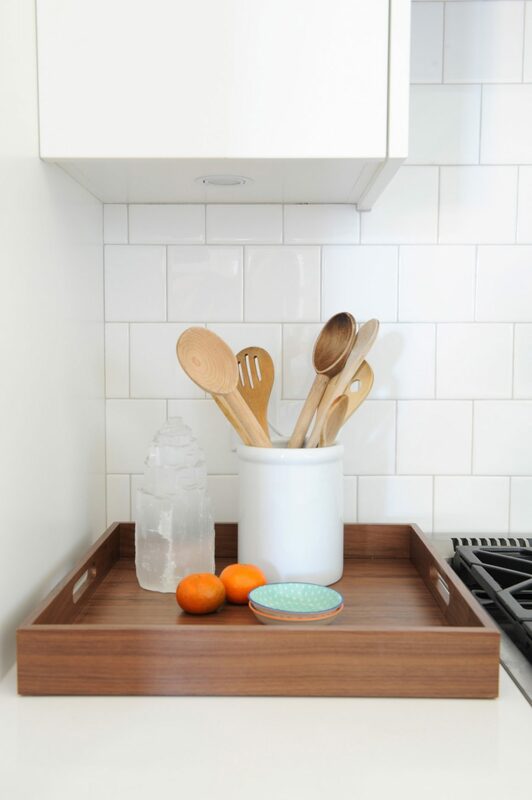 It pops out and makes it feel like a custom-designed kitchen,” Nelson says.